GH WindFarmer was developed by Garrad Hassan GL to facilitate the design of wind farms. Maximizes the energy produced by wind farms, while minimizing environmental impact. WindFarmer GH users gain a competitive advantage and precision thanks to the over 25 years of wind energy experience of Garrad Hassan..
GH WindFarmer allows the user understand in detail what happens in a wind farm in order to take informed decisions. WindFarmer GH models used are transparent, valid and documented. This gives the user complete control and an unmatched precision in wind farm design and implementation and also for the calculation of energy efficiency. GH is a commercial software WindFarmer tested and validated. 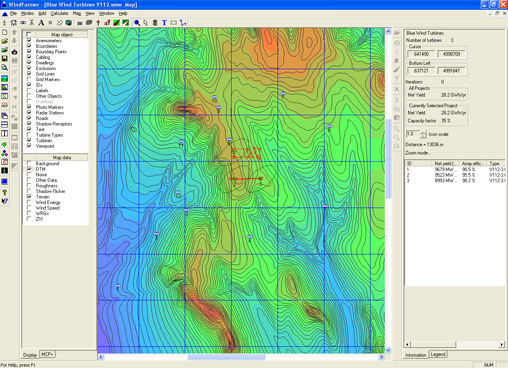 It is used by GL Garrad Hassan and many other major clients worldwide for the design and evaluation of wind farms. With this software in addition to layout design (the basic module) one can design the road network, the power supply network; one can make a 3D visualization as well as a financial analysis of the park(P90)..